This seller is on vacation. Please return after April 30, 2022 to purchase this awesome product! The default output voltage is configured to 3.3V, while t is configurable through 3 programming resistors. Please note that the video cover page shows prototype 1. What you will get is the final version, as shown on the pictures. PNMini is a family of high performance, easy-to-use DC/DC Power Modules for DIY electronics. PNMini can be used as positive supply or negative supply. If both positive and negative supply rail are needed, just connect two PNMini modules together. No hardware changes are required. 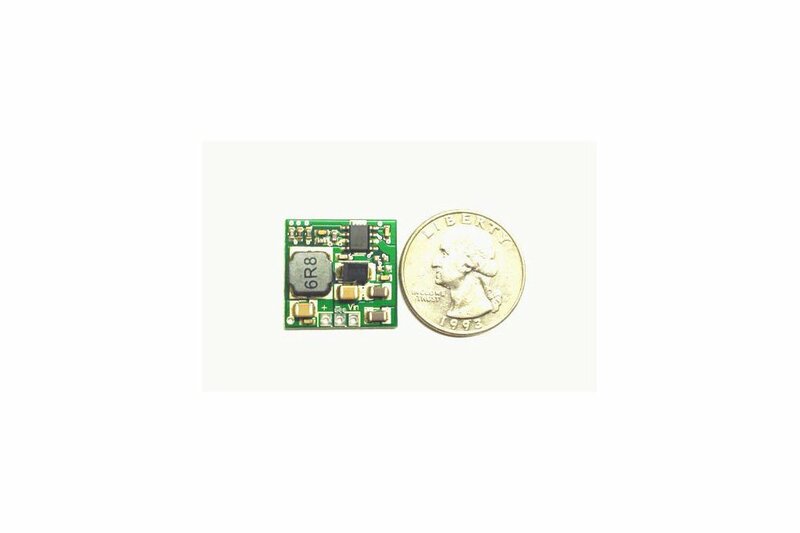 PNMini is available in a small PCB package that enhances thermal performance and allows for hand soldering or plugin use. 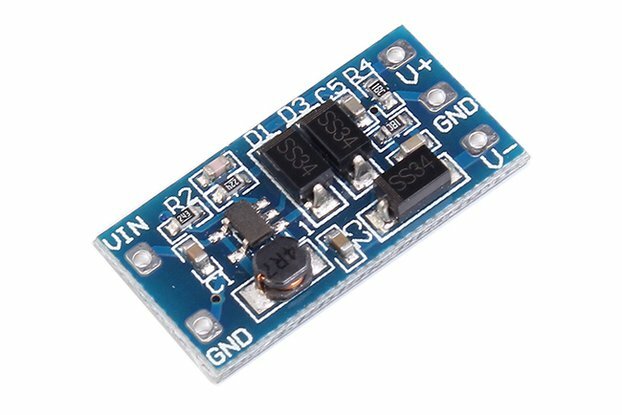 It provides +3.3V/-3.3V, +5V/-5V, or +12V/-12V output directly to your circuits requiring no external components. PNMini can be used to power your Arduino drone. 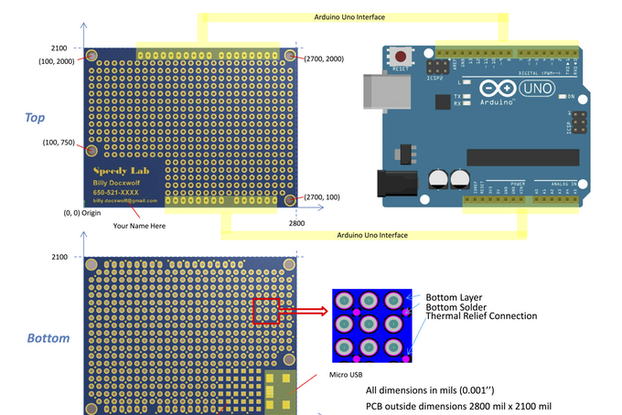 A miniature Arduino board is usually powered by 3.3V. The motors and sensors are usually 5V. 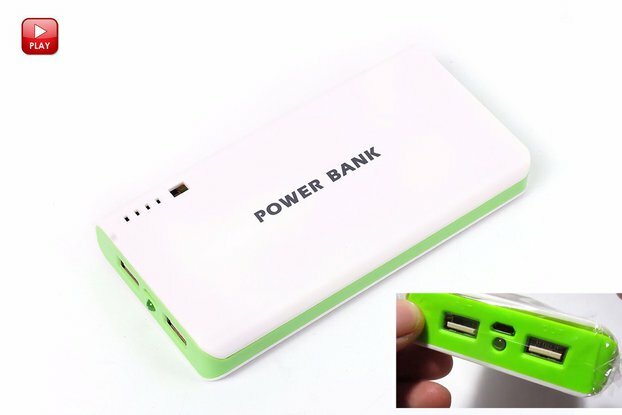 You can use 3 li-ion battery stack and two PNMini to get the voltage you want! It's more efficient than LDO. PNMini provides up to 92% efficiency while LDOs can hardly achieve more than 50% efficiency. That's a 40% longer battery life for your design! Another application example is a simple ECG amplifier which can display your ECG waveform on a oscilloscope. For sensor or amplifier applications, dual supply is often preferred. 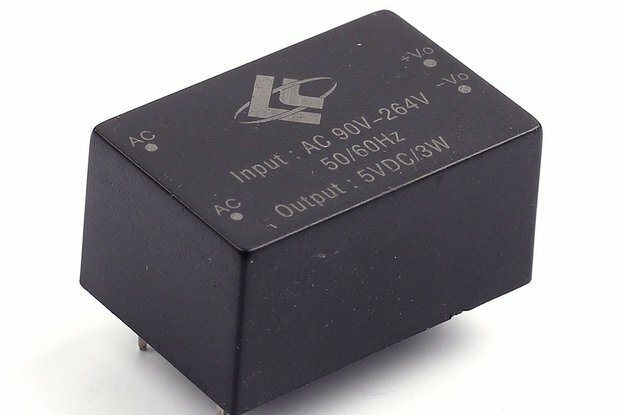 Positive supplies are everywhere, but sometimes it's difficult to find a negative power supply. PNMini solves the problem by generating both positive and negative supply from a single source. PNMini combines positive and negative supply capability into one module. The positive supply is a buck converter; the negative supply is a inverting buck-boost converter. 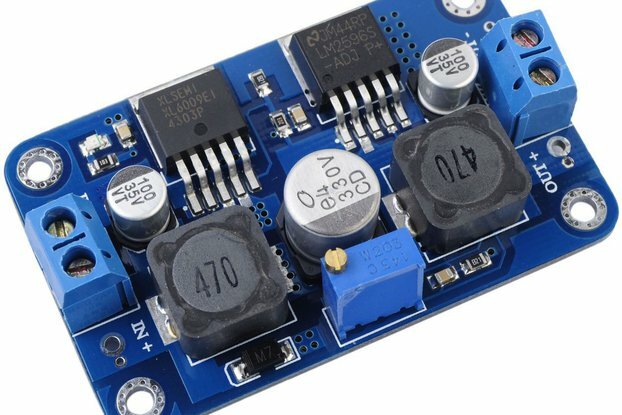 Some buck converter controller ICs can be used as inverting buck-boost converter controllers. A Texas Instruments application note (http://www.ti.com/lit/an/slva257a/slva257a.pdf) has one such application. The figure below shows that if you switch the diode and the inductor in a buck converter, it becomes a buck-boost converter. And this is how PNMini works. How does the efficiency compare with 7805/7905? PNMini is a DC/DC switching regulator, which can easily achieve more than 90% efficiency; 7805/7905 are linear regulators, the efficiency is usually below 50%, depending on the input and output voltages, and the quiescent current of the regulator. The efficiency of a linear regulator can be estimated by Efficiency = Vout/Vin * 100%, if the quiescent current is very small. From the equation, at a certain Vout, the higher the input voltage is, the lower the efficiency is. Below is a comparison of PNMini vs. LM7805. How does it achieve high efficiency at light load? At light load, the switching noise become significant. Instead of always switching, PNMini enters a mode called "Burst Mode", meaning that it switches for a certain amount of time, and then stops switching. When the output voltage drops below a certain level, it switches again. In this way, the switching loss is reduced at light load, thus the efficiency is improved. What kind of protections does PNMini have? PNMini is a very robust design, it has over voltage protection, thermal shutdown protection, and short circuit protection. The way it protects itself from damage from a short circuit is by a technique called "cycle-by-cycle current limiting" - if the current exceeds a certain level, PNMini will cut the PWM waveform of the current cycle thus limits the current from growing. What about the other specifications such as line regulation, load regulation, start up, transient response, and output voltage ripple? Don't worry! The PNMini solution is FULLY tested. It's not something you get from eBay and get nothing but a board. You get comprehensive test data on each of the specification!! Great fit for my needs! Seller is very responsive to all questions regarding the items purchased. Took it a step further and configured the board for me, eliminating the need for soldering in the resistor. Very nice to deal with and would have no problems ordering again if the need arises. These little guys handle a good load, and are fairly easy to use. They come with 3 surface mount resistors set for 3.3V output. Depending on how the leads are attached you get either +3.3V or -3.3V. The docs describe changing R1 / R2 in order to get different voltages, but I recommend instead bridging across the existing 10K resistor R3 to lower its resistance. I needed a couple voltages for my project, so used 2 modules. By bridging a 5.1K resistor over R3 it ends up being 3.38K, which gives pretty close to 5V. That positive converter runs very efficient -- really cool while delivering about 700ma. In another module I needed -12V, which I got by bridging a 1K resistor over R3 to end up with 909Ω. This negative-side converter got much warmer, even though it was only delivering about 500ma. So for giving negative voltages perhaps it's not quite as efficient, but still it never gets hot to the touch. Only warm. One reason I really recommend to bridge resistors on R3 is if any added-on resistors ever fall off, the supply just reverts to a lower voltage instead of snapping to a higher one. So less chance of damaging things. Also in order to mess with Rfb1 / Rfb2 you'd have to remove the existing resistors. So I find it much easier to just play with R3. The actual soldering of the resistors was really fiddly, since the surface mount resistors are REALLY small. I ended up leaving them in place, and soldering between pins 5 and 7 on the IC. Pin 5 (VSENSE) is on the corner of the chip, and very easy to get to. And really instead of pin 7 (just GND) then there's a nearby capacitor and resistor hanging on ground that you can solder onto. I've got a fairly big iron, and this was about the easiest for me to mess with. Perhaps evident, but just so everyone is aware -- the converter doesn't boost, it only lowers voltages. And it does it pretty well. So nice, I bought a couple more. I don't think you'd regret buying these.